It seems that about 139% of the population of Scotland is delighted that an agreement has been reached over a future for both the INEOS refinery and petrochemical plant. And well everyone should be—as one of the largest and most important industrial sites in Scotland, it was home to not just 1,400 jobs, but 1,400 well paying, skilled, production jobs. Where once we Scots had more such jobs than we could count, global development has left us rather more short these days. While a job that supports a family is never to be sniffed at, it seems the recent recession has made politicians in particular rather too ready to bundle up sheer numbers and worry less about the quality and longevity of jobs created or retained. While it is welcome to have more rather than fewer jobs for people to choose from, they are not all equivalent. ONe of the reasons Osbo has been struggling to make upward movement out of the £1tn-and-growing debt chasm is that most jobs powering this sickly recovery (0.8% in Q3) are service jobs. They tend not to pay well nor to survive any belt-tightening. What Scotland (and indeed the UK) needs are skilled jobs, such as the INEOS plant has by the hundreds. These include chemists, civil & process engineers, skilled operators of a variety of complex equipment and more universal jobs like plumbers, welders, electricians etc to be found elsewhere. If Scotland is to make its way in the world, not only should we not be losing jobs like Grangemouth but we should be knuckling down and creating them. This is an aspiration in which Scottish Enterprise has been falling down on its £1/2bn job. For a quick example of what a chocolate teapot they are, try this week’s Herald. Actual 21st century business development has been driven by increasing globalisation and the fluid investment strategies of multinational tycoons like Jim Ratcliffe who built INEOS up from nothing into a $43bn (£30bn) turnover force in global petrochemicals. Scotland is perfectly capable of achieving such success—look at Brian Soutar with Stagecoach or Tom Farmer with Qwikfit—but we seem to have lost some of the touch we had when the Glasgow Tobacco barons of 200 years ago paved Scotland’s way into leading Victorian industry. What went wrong at Grangemouth and nearly cost us a pivotal facility seems to have been an inability of Unite and its officials to recognise that they now operate in the 21st century and not the 19th. Consider how ludicrous it would have been for Scotland to be Europe’s prime oil & gas producer and have no indigenous ability to either refine or produce the rich spectrum of key chemicals that come from it. To rummage on the trigger for the dispute would be treading on the political corns that should more rightly be dealt with in the not-yet-announced Falkirk by-election to replace Slugger Joyce. Far more relevant is the little-known appreciation of how demand for refinery products has changed. Grangemouth’s processes were built 40 years ago when leaded petrol, large cars and low demand for heavier volatiles was the norm. In the intervening decades, unleaded has come to power smaller cars, easing relative demand for petrol but greatly increasing it for diesel and heating oil. The resulting mix of demand was not one that Grangemouth was built to supply and so its operation had, despite overall demand rising and business being fundamentally good started to lose money. Prior to INEOS buying the plant, BP had been able to offer generous wages and benefits (including a generous final-pay pension plan) to its generally happy and productive workers while the ‘old’ mix had kept it profitable. INEOS, being skilled in running such plants elsewhere, tried what they could to keep the ageing plant profitable. But when it realised this was not going to work, they pondered before going to the workforce and clearly came up with a brinkmanship strategy in which they saw that they could not lose: confront the workers to accept losses to some wage/pension generosity in exchange for a guarantee that the £300m investment necessary for the future would be forthcoming. Otherwise, close the plant; stop the losses; concentrate on the rest of the INEOS empire. Had that been all, the workers—knowing how bleak the financial climate beyond the gates is and looks like remaining—may have seen their weak position. But Pat Rafferty, a well experienced union official of the old school who cut his teeth in the industrial mayhem around the time the plant was built, thought Unite could fight this. Back in the day when BP ran the site, when companies had little offshore interest, when governments were expected to facilitate industrial peace (especially in nationalised industries) rather than wring their hands at the periphery, picking such a fight usually worked. But Maggie showed how it could be done, however brutally and unfairly, to wrong-foot workers and their legitimate grievances: you ensure supplies from elsewhere, limit the impact of any action using forces of the state and effectively starve them out. In the single market that the world economy has virtually become, multinationals operating across frontiers have a huge advantage over any national trade union, especially when global markets are depressed and shipping companies with cape-size tankers lying idle would sell their first-born into slavery just to keep from going under. INEOS owner Jim Ratcliffe and all his management on down would be briefed to hold the line and brazen it out once the announcement of revamp or closure was made. They made a strong case that the plant was losing £10m and practices had to change. Rafferty, thinking in old money and unable to break postures of a lifetime, walked right into the INEOS trap and disparaged the offer they put on the table, despite the fact that management were already running down operations for H&S reasons in anticipation of some form of union action. The workforce split half-and-half, which gave INEOS the leeway to announce permanent closure and ridicule Unite which had painted its members into a losing corner. If Rafferty and Unite were taken aback by the speed and decisiveness from INEOS, that was nothing compared to the shock wave that went through the hundreds of well paid workers who had watched their mates lose good jobs and take lesser ones and had not dreamed it would happen to them. It is a tribute to them that they quickly persuaded Unite to change tack and to Rafferty who did not do a Scargill and go down with the ship to no great purpose. Overall, a lesson in 21st century industrial relations needs to be taken: such a plant can be a money-spinner for company and workers. And once a skilled welder needed only to cross the road to another shipyard if the owners got stroppy. But if it is seen as a skirmish in antiquated class war, there is every chance that the owner/employer will have global markets to fall back on and the absence of local alternatives will give workers Hobson’s Choice. This Grangemouth event must be seen as pivotal in industrial relations, much like the Miners’ Strike. That may stick in the craw of many of us, especially union members. But, truth be told, he’s quite right. 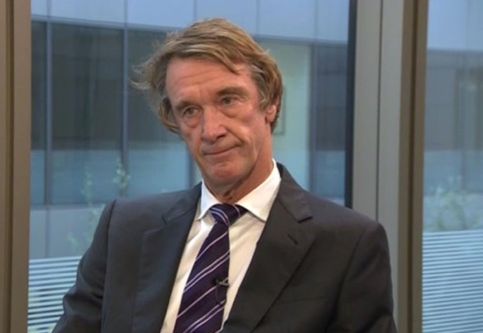 What DOES it take to make Jim Ratcliffe, Founder and Chairman of INEOS happy? This entry was posted in Commerce and tagged Grangemouth; INEOS; Unite. Bookmark the permalink.